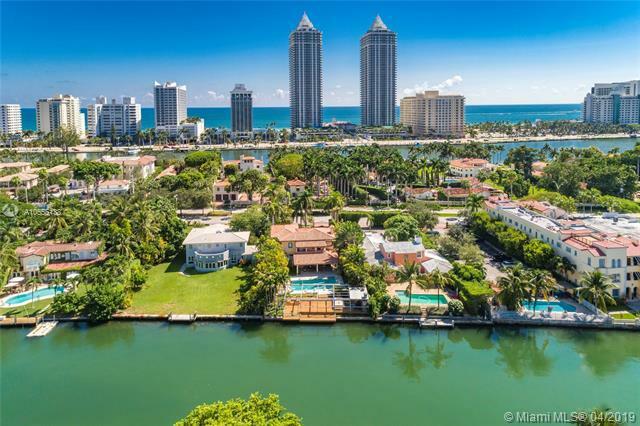 Best Waterfront Opportunity in Miami Beach. On historic Pinetree Drive, this gated waterfront home is situated on a 14,000+ square foot lot. Enter this Mediterranean Villa, and leave the bustle of Miami Beach behind. Inside, almost 3,800 sq ft open floor plan combines living, den, dining, and kitchen, which share the same water views. Two ensuite bedrooms downstairs (including maid's quarters), and 4 more ensuite bedrooms including master suite upstairs. Large backyard for entertaining features a covered patio, pool, and wooden deck overlooking the canal with a built-in pizza oven and a long, genuine Argentinean wood-fired parrilla plus 70 ft of private waterfront facing the Lakeview neighborhood to the west. To the east, you'll see Miami Beachs iconic Blue and Green Diamond buildings.